As I impatiently watched my computer struggle to bake out the correct lightmaps for the fourth time in a row, I was struck by an incredibly bad pun. I'm back in the game again, and not just metaphorically. After what seemed an eternal hiatus from the norm, I'm finally adjusting to my new home well enough to write words that no one will read. Except for my number one fan, my dad, of course (love you!). To say the last month-and-a-half has been hectic is a severe understatement, but good things have finally taken root. I have a beautiful apartment in the quietly-bustling downtown St. Paul with my girlfriend, and more freelance work than I care to admit; if only the opportunities spread themselves out neatly instead of all herding together at the beginning of September! I just finished one of the more unique jobs I've done to date: writing and developing a college-level course. The class was GAM113 Introduction to Game Tools for the University of Advancing Technology, and I spent a great deal of time recording video lectures of both the Unreal Development Kit and Unity 3D. It was a lot more work than I originally anticipated, but I had a lot of fun doing it. Once the semester ends I'll find out whether or not I did well enough to warrant additional developments. I was recently contacted by Iron Belly Studios to do some contract work, which is why I'm writing this and watching the progress bar on my rendering. This is my first paid level designer position, and so I'm incredibly nervous and excited at the same time. I'm also in the beginning stages of designing and building a small business website on the side, and so with all of this work it's hard to say when I'll get more time for HeroCraft. Creating a game with inexplicable emergent behaviors is challenging, to say the least. After all the playtesting though, I think these five action states really encompass all of the abilities and when they are to be used. It's really simple when you boil it down to thematic purpose, too. Attacks are used in combat against your opponents, while Turn abilities represent things that take time or need to be prepared (such as a spell ritual). Ambush is the state of the stealthy green players, opting to inflict damage before the battle has even begun, and Passive represents the act of wearing armor and other such benefits. 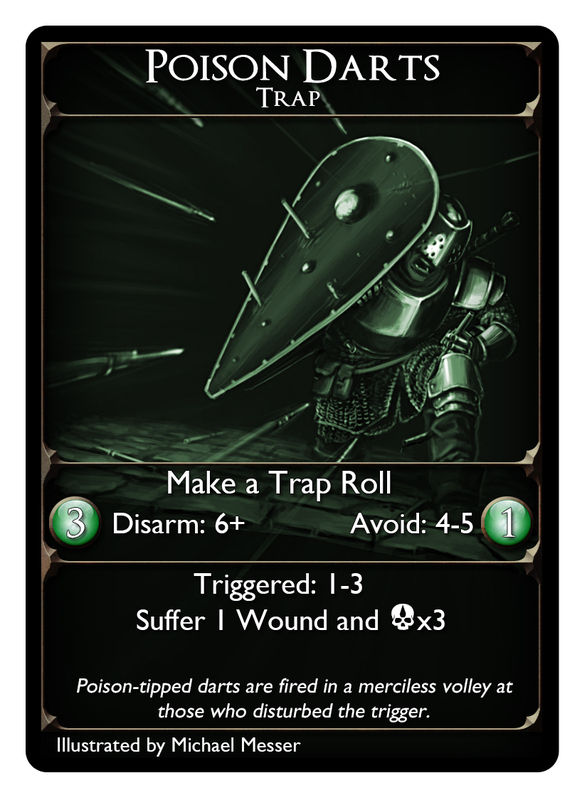 The last, and newest, is Bolster, which accounts for defensive in-combat abilities such as hunkering down behind your shield (against a Poison Dart trap, perhaps?). 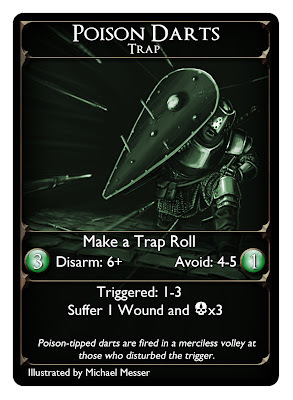 I'll just have to remember to include some shields in the armor artwork to mitigate the flak for removing them as a Boon type. Some people get very defensive about their shields. Layers of puns. Layers.